This weeks WFMW tip is a two-fer. Let's get started. Every member of the Jubilant household loves to watch movies and listen to music. We have an embarrassingly large collection of cds and dvds. In order to deal with space issues we decided to put our music and all of mommy and daddy's dvds in a zippered cd case similar to this one. We don't put the kids dvds in one because being able to look at the pictures on the box helps them pick one out on movie night. Later when that is not such a factor, we'll slide them into one (or nine) of these cases also. Now, the question becomes what to do with all the jewel cases that the cds and dvds came in? Well, if you are a rubber stamper and/or scrap booker you can tape (or use a glue dot, Zots is my favorite brand) your unmounted stamps into the jewel cases. Just remove the picture that came with the case, cut a similar sized piece of paper with your stamped images on the front and you are in business. The part that holds the cd pops out pretty easily, so no worries there. Just finagle it a little, you'll get it. This kind of storage allows for easy access and either upright or stackable storage depending on your space issues. Also, we have used jewel cases as picture frames and gave them as gifts. Just cut your background paper to size and decorate it as you wish. Then, glue/tape your picture to your background and slip it to the front cover of the jewel case. Pop out the part that holds the cd and use that side to add a poem or say Happy Birthday. One year for Vacation Bible School the craft was similar to the picture frame idea above. The theme for the week was travelling around the world to tell people of God's Love. Instead of the picture of the child on the outside, they put the picture facing the inside of the front cover as if it was a passport. Colored pictures of the countries they "visited" that week were put inside also. Then they added a cd of the music they learned that week. It is one of the more unique crafts the kids have done and we still have each child's "passport" to this day. 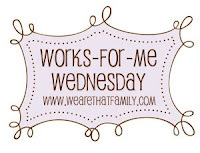 For more WFMW tips click on over to We Are That Family. I am also linking up to Room to Inspire. Click on over for some more creative ideas. The CD cases...why, I'm sitting here going DUH! Why didn't I think of that?!?! So simple. What a great idea! The stamp idea, wouldn't we need to make sure it's not a "permanent adhesive"?